Step 2: Whereis LogWatch installed? These days by default most of the distros comes with LogWatch installed. Verify the installation using the below command. If it already finds the installation, then you no need to install, else install using yum. (Know how to configure Yum). 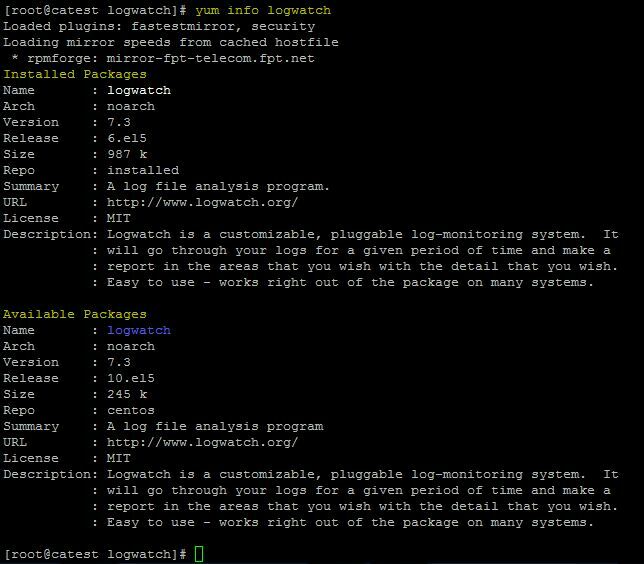 You can also download the LogWatch and install through source installation. if you had installed through RPM or YUM, usually LogWatch would be installed in the /usr/share/logwatch directory. Our main focus would be on the default.conf directory inside logwatch. This consists of services and logfiles directories which lists the configuration files of services to be monitored. services directory would consists of configuration files of services to be monitored. For eg: services like sshd, dhcp, httpd, disk usage, network etc., LogWatch monitors and generates reports of all the services listed in the services directory. You can edit those configuration files for each service to fine tune what are the things you are keen to analyze. To disable LogWatch Email Reports: Follow this guide.